The Shrimpers Trust can now announce details of the 2018/19 Season Player of the Year Awards. The event will be held on Monday 29th April 2019 in the Shrimpers Bar, Roots Hall, with doors opening at 7.00pm for an 7.30pm prompt start and will be hosted by SUFC Legend and Match Day Host David Crown. Admission is free to all Trust and Junior Blues Members, tickets will not be issued, however Membership details will be checked at the door. 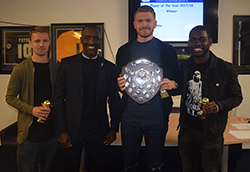 This Season the Annual Shrimpers Trust POTY Awards will include the Junior Blues Player of the Year, Goal of the Season (Martin Cranmer Memorial Cup) and the Shrimpers Trust Youth Team Player of the Year with the winner receiving the Tom Grace Memorial Shield. The Awards will be attended by SUFC's 1st Team Players and Management along with the Academy's U18 squad. There will also be an Auction of signed SUFC memorabilia during the evening.